Florence to touch: finally a tactile Florence that allows the visit to the most famous sites and monuments of the city’s historical center. 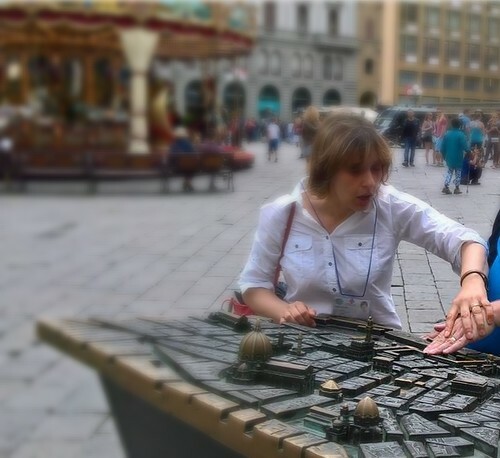 Through the use of tactile maps and three-dimensional models the guest will be able to overcome every visual barrier and live a unique experience exploring the heart of the city, accompanied by an expert tour guide who will tell about the history of Florence, with anecdotes and curious legends. Florence encloses in a restricted perimeter, a high concentration of works of art in an urban fabric in which you can find layer upon layer of testimonies of different historical periods, from its Roman foundation until today. In fact orientation is not always easy. The function of a guide is precisely to facilitate the use of this rich historical and artistic heritage, developing routes and tours that fully satisfy the most different expectations and needs. 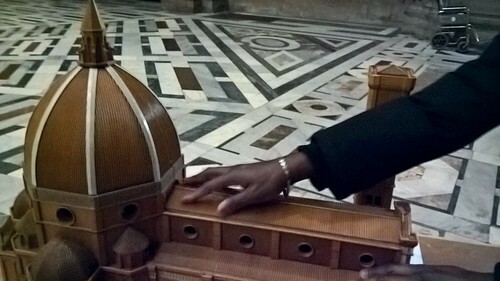 This particular tour through a tactile Florence is structured to give the opportunity to people who are blind and visually impaired to live the cognitive experience of one of the most beautiful cities in the world. If, instead, you wish to discover the masterpieces of classical art, at the Uffizi Gallery you can explore some original sculptures touching them with hands. The sculptures are made in different materials such as marble from Carrara, black marble or porphyry. From the Roman sarcophagi with bas-reliefs that recount the adventures of legendary heroes, you will go over history through the portraits of famous people of the past such as Homer, the emperor Caracalla, the magnificent Hermaphrodite, the sculpture of a centaur, a mythical creature half man and half animal, up to the sleeping cupid owned by Lorenzo the Magnificent. This tour also includes a plastic scale model of the Birth of Venus, Botticelli’s famous masterpiece. The tour are led by professional tour guides who have been trained at V.I.V.A.T (Italian Volunteers Tactile Artistic Tours). Come and discover the Florence to touch!